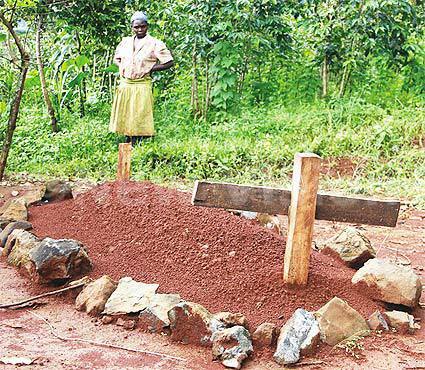 A woman stands by the grave where the body of man who was thought to be Gimugunyi was buried in January. Simon Gimugunyi, a peasant farmer in Zeugula village in Kabeywa sub-county in Kapchorwa went missing on January 22, this year. After a week-long search, his ‘body’ was discovered at the foot of a rocky cliff at Gibutongo in Gamogo subcounty. The charred body, burnt beyond recognition in a wildfire, was discovered by children who had gone to play in the bush. The body was buried at Gimugunyi’s home in Zemugula village after a piece of a shirt similar to the one he was wearing was found on the body. But the ‘death’ came at a cost. A mob descended on the Kabeywa LC3 chairperson, Wilson Walenda, on March 30 and beat him to near death after suspecting him of having a hand in Gimugunyi’s ‘death’. Several houses were torched and crops burnt by the wild mob. Murder suspects Walenda, together with Luina Kayiga, an aunt to Gimugunyi, Charles Nandagala and another man only identified as Odoto, were herded by furious residents to Kapchorwa Police Station. Gimugunyi had been embroiled in a land conflict with Kayiga. On January 21, the clan had sat and ruled that the disputed acre of land belonged to Gimugunyi. Just a day after the ruling, Gimugunyi disappeared. The four are still on remand in Kapchorwa prison charged with murder. “We asked his children and none of them knew where the father had gone. The LC3 chairman (Walenda) was suspected of having a hand in the murder because he was against the ruling of the clan that gave the disputed land to Gimugunyi. He even wrote a letter to the clan head to that effect. That’s why people thought he murdered Gimugunyi,” explained Moses Chesang, a resident of Tarito in Kabeywa sub-county and brother to Walenda. Another source, who declined to be named, said Walenda had interest in the disputed land because of his protest letter. As the village was still coming to terms with what had happened, Gimugunyi ‘resurrected’ at Sipi trading centre on June 21. 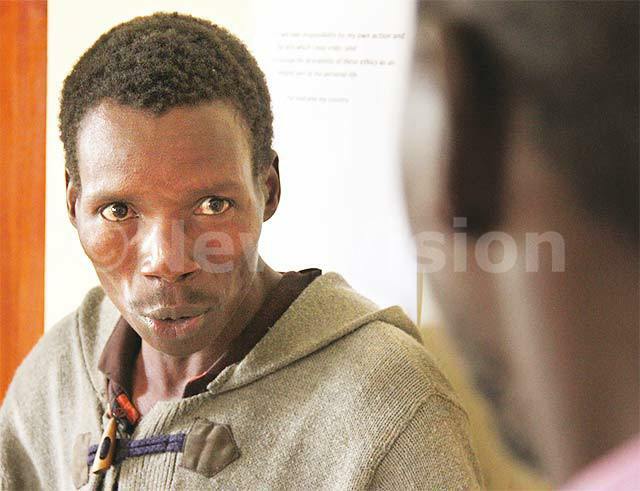 Some residents thought he was just a look-alike, but a bodaboda cyclist was not convinced. better front view of his facial features. It was him! Together with another person, they ‘arrested’ and took Gimugunyi to Sipi Police post from where he was transferred to Kapchorwa Police Station,” Chesang said. payment. Only three goats remained to complete the pay. Though Gimugunyi paid the remaining goats, Kayiga stuck to the land, which prompted the intervention of the clan. By Monday, residents of Kabeywa were still pouring at Kapchorwa Police Station to confirm whether the detained person was really Gimugunyi. “People have been swarming this place to see whether it’s really him. They think it’s a ghost. He has no criminal case to answer because he has committed no offence. But we are detaining him pending the decision of the Kapchorwa district security committee. Our fear is that if we release him, the angry relatives of the suspects who were wrongly accused can descend on him and beat him to death,” said Jeremiah Musumba, the head of Kapchorwa Police Station. withdrawn if Gimugunyi is presented before court. He also said the Kapchorwa district security committee was set to meet on June 29 to discuss, among other things, how to return Gimugunyi back into the community without stirring up hostilities. Asked where he had been, Gimugunyi explained that he had crossed to the home of his father, Kasaga, in Kapenguria, Kenya. “I went away on January 22, without informing anybody in the Omwonya negotiated return village, including my children. I had planned to come back quickly. Unfortunately, when I reached Kenya, one of my uncles became severely ill and I couldn’t get back fast. When I came back last Saturday, I was apprehended and brought here,” Gimugunyi said. New Vision visited the home, the eldest son, who was the only person at home, fled into the bushy coffee plantation. Gimugunyi, a peasant, does not own a phone. He divorced his wife in 2008. He has been staying with three of his children at Zemugula, while two are in Kenya with his father. “It’s bad when somebody is accused and injured wrongly. I’m sorry for whatever happened. I’m ready to reconcile with all those who suffered because of my blunder,” he said at Kapchorwa Police Station. Whose body was buried at Gimugunyi’s home ? “Because the body was found in January, we believe it might have been of a hawker who was killed and thrown over the cliff. Hawkers usually throng this place during the dry season. There was another body that was discovered at the same cliff in 2012. We have widely come to believe that murderers use this cliff to dump bodies of their victims,” Leonard Magomu, a resident of Tarito village, said.